After you’ve hired a funeral home answering service, you may find that everything isn’t as good as you thought. Maybe you didn’t research the service or find one that catered to families in need of sympathy and care. Whatever the reason, there are telltale signs that it’s time to find a new answering service for your funeral home. 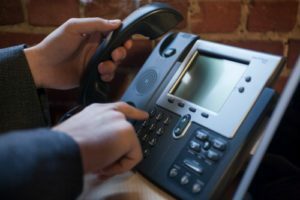 One of the main reasons funeral directors have shied away from funeral home answering services in the past is concern that the call specialists may not be sympathetic towards the families they speak with. This is one of the main priorities to express towards callers in distress. As a funeral director you provide the families you assist with a caring environment and show sympathy during a family’s stressful situation. When you hire a service and the call specialists don’t convey that same emotional stance, it’s time to find someone that can and will. Having to get a funeral together already puts people in an emotionally vulnerable state and makes them anxious to get the help they need. They are already dreading talking about the situation, so calling a funeral home to be placed on hold for a long time makes the situation worse. Callers are already anxiously reaching out for help, but long holds make them feel stranded and helpless to move forward. If people complain about being on hold for long periods of time, or if you notice this when reviewing calls, look for other funeral home answering services that can provide better, more informed service without long holds. On the other end of the spectrum, you may have experienced times where families were rushed when speaking with answering service call specialists. You know that the people calling your funeral home are experiencing a wide range of emotions, and may also be distracted with other things or nervous to talk about their current situation. They may need time during the call to collect their thoughts or emotions, so being rushed by an operator can cause greater stress. If your answering service is guilty of this, it’s time to shop around. Directing funerals takes a delicate touch, and funeral home answering services should be up for the challenge. If yours is failing in the areas listed above, it’s time to go with a service that can provide the families you serve with a more positive experience.